Steven Paul "Elliott" Smith (August 6, 1969 – October 21, 2003) was an American singer-songwriter and musician. He was born in Omaha, Nebraska. He grew up in Duncanville, Texas. He died of stab wounds to his chest in 2003 when he was 34 years old. It is not known if it was suicide or murder. At the time of his death, Smith had been making his sixth album From a Basement on the Hill. It was released on October 19, 2004. In 2007 another album called New Moon was released. 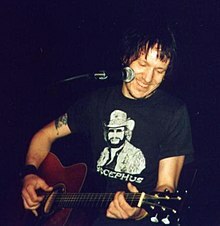 Wikimedia Commons has media related to Elliott Smith. This page was last changed on 5 May 2016, at 09:31.